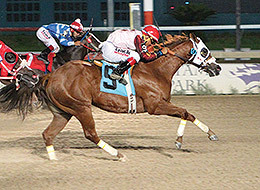 Miss Alluring Menace, under jockey Jose Alvarez, cruises to victory in the richest TQHA Sale Futurity(RG2) in history Saturday night at Retama Park. SELMA, TX—JULY 30, 2016—An outstanding field of graduates of the 2015 TQHA Yearling Sale made their owners very proud this evening at Retama Park. None were beaming more than Gus Barakis of Scarlett Hill Farm Inc whose homebred filly Miss Alluring Menace rallied to take the richest race of the Retama Park meet Repurchased for $9,500, she earned $197,157 in the $443,050 TQHA Sale Futurity (RG2). Trained by Judd Kearl, the daughter of Specially Alluring out of the Executive Menace mare Special Menace Miss was making her fifth career start in this final. She ran second in her trial to secure the eighth fastest qualifying time. Breaking from post position nine under Jose Alvarez, the chestnut filly accelerated powerfully in the final 30 yards, catching Thriving Ivory to notch her maiden-breaking score. She covered 350 yards in :17.94 over s fast track. "We breed our own and know how they are raised and cared for," said Barakis. "That is the most gratifying part of this. I am a breeder; my whole family breeds horses. That's what we love. Quite candidly, I know we just won a big Futurity, but that isn't the best part. The fun for us is raising those babies and watching them develop. To see the matings we develop the year before turn out like we hoped they would; that's really what we love." Barakis had considerable praise for Kearl, who is having a banner year, and currently stands as the leading AQHA trainer in both wins and earnings. "Judd in the last few years has become my best friend! ', he added. The victory was bittersweet for Kearl as his other qualifier, Maybeyes, owned by Cochran Enterprises, was shaken up when Cartel Flash flipped in the starting gate during the load,. Cartel Flash was scratched, but Maybeyes ended up finishing second to last. "My filly was sitting on go and she hit the gate, knocked a few teeth out and came back with some cuts and bruises," said Kearl. "She'll be alright." However, he had faith in Miss Alluring Menace, who was overlooked by the betting public at odds of 21-1. "She's a great big filly and I told Gus when we bought her back at the sale that she would be a good one," said Kearl. "In her trial, she had a terrible trip, but she came flying at the end. As good as she got away tonight, I knew she would be there at the end." The winner paid $44.60 and will be pointed to the Dash for Cash Futurity at Lone Star Park. Thriving Ivory, an Ivory James filly bred by current leading AQHA breeder Bobhy Cox, broke perfectly under Francisco Calderon, and was just caught at the wire. Trained by Angel Sanchez, she was the tenth- fastest qualifier, but showed her class this evening. Angel Hernandez owns the $9,200 TQHA Yearling Sale graduate from the First Down Dash mare Shes Dashin First. Also bred by Scarlett Hill Farm Inc., One Sweet Picky races for owner Ricardo Barrera. Rodolfo Sanchez conditions the fastest qualifying filly by second crop sire One Sweet Jess from the Sticks N Stones mare Sticky N Picky. Ridden by Ivan Carnero the bay filly pocketed $48,736 for the effort. Jayronimo, the fourth fastest qualifier finished fourth for his trainer, Brian Stroud won four races on the Saturday card. Awestruck Favor, Rc The Duke, Like A Denali, Maybeyes and Courageous Flight completed the field. The TQHA Yearling Sale continues to offer excellent value for prospective owners. Past successful sale graduates include Oak Tree Special, Azoom, Snowy Alibi and last year's sale success story, Duponte. Bobby Cox bred the colt, who was purchased for just $6,700 in the 2015 TQHA Yearling Sale and has already won the Harrah's Futurity and $1.1 million Heritage Futurity (G1). He has already earned $578,519 this year and will run in trials to the Grade 1 All American Futurity at Ruidoso Downs in August.